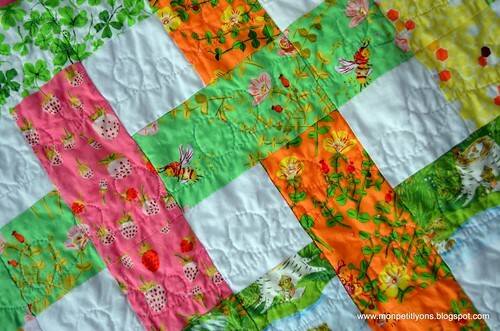 I am so excited to be a part of Diane's Blog Hop for the Grandma's Lawn Chair Quilt Pattern. In case you don't know Diane, she is an amazing person and crazy talented with sewing and designing. She has been creating mind blowing paper piecing patterns in her craftsy store (I just bought one of her alphabet patterns and love it!) and now she has released her first quilt pattern! As soon as I saw the Grandma's Lawn Chair pattern I gasped with excitement and started cutting away! Into my precious Heather Ross Briar Rose, nonetheless! I am so glad I did and I was kind of amazed when I had a toddler sized quilt about 48 hours later (and no I didn't stay up all night or anything). This looks complicated, but it is so fast to sew! I ended up making the toddler quilt, but the pattern comes with options for a smaller baby quilt and larger lap size. I am thinking of making a lap size quilt next with scraps and charm squares from my rainbow swaps! I free motion quilted this with rows of loop de loops and backed it in a Michael Miller ta dot print. For the binding I chose some green seeds from the Flea Market Fancy reprint. You can purchase the pattern HERE on Craftsy or HERE on Etsy. Plus, Diane has offered a free pattern to one of my readers. Leave a comment telling me what fabric you would use to make your own Grandma's Lawn Chair quilt and I'll pick someone to win the PDF of her pattern. I'll leave this open until Monday, September 23. 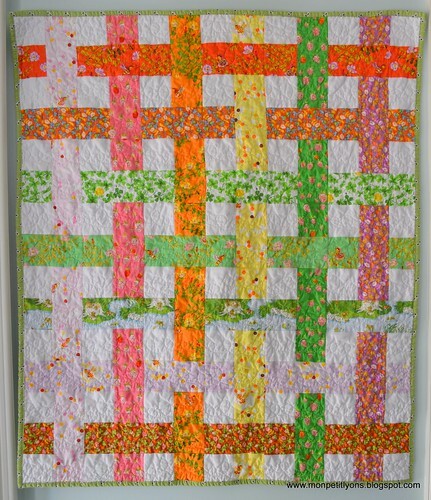 Be sure to stop by the other blogs to see all of the beautiful quilts! I'd like to start out with a baby quilt and then get up the nerve to cut into my collection of Denyse Schmidt fabric! I've been hoarding waiting for a pattern that can showcase great fabric & be interesting as well. I love the Briar Rose quilt you made and can relate to how you felt when you decided to 'CUT'! I think I would use some of my warm fall colored batiks. With a cream background it would look so comfy. Love that you cut into your Briar Rose. Mine is still staring at me on the shelf. I might try something low-volume with some text.. Great pattern! I'd make a scrappy ROYGBIV quilt. Thanks for the giveaway. I have a stash of Nordika that I have been eyeballing for a project. Thanks! I love the way your quilt turned out! I think I would make it completely scrappy using low volume prints for the background and probably (knowing myself) a rainbow of other prints! I think it'd look fantastic in solids as well! Maybe like 5 or 6 different colors, or an ombre look...oooooohhhh that'd be really pretty!!! Thanks for the chance to win this pattern! This is so pretty. I can see this quilt in Kona solids. I think it would look great with Nordika (but really - any fabric would be awesome!). I would like to make mine scrappy with greens and purples. Thanks for the chance. I don't know wich fabric line I'd use, but I have to say that I really like yours, those little prints and colors are perfect for a little girl! I think I would make it very scrappy and have each strip different from my stash. It would have to be bright! I'm also thinking red, white and blue would be great! I would have to choose Nordika. I love this because it truly does look like the old lawn chairs! I think this would be very cute in Apple of My Eye. Love this pattern. I would use Lori Holt's Gracie Girl. Thanks for the chance to win! oh, i could totally see this in solids. i like the prints, but think a gradated stack of solids could make this really special! I love this pattern - it would look fabulous in rainbow colours! I think Simply Style would great in this pattern. Thanks for the chance to win. I'll search some special fabrics for this quilt, probably some batiks, since I love those. Wow, this has to be one of my favorite renditions of this quilt. I love the froggie scene print running through it. This pattern has so many possibilities. I'd be tempted by legacy prints from angela walters. I would probably use novelty prints or batiks to make this great quilt. I would use some solid fabrics. 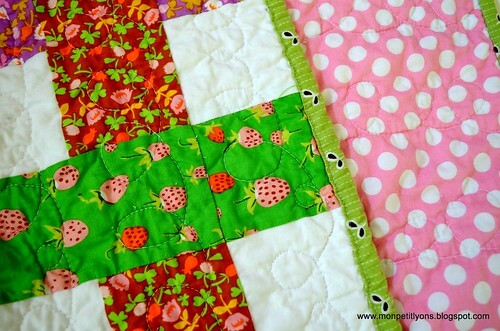 Your quilt is beautiful, I love love love this pattern. I hope I win!